underthebridge, originally uploaded by jahansell. Just made it under the wire - 40 minutes left in the December theme day and I'm just now getting my bridge picture up! 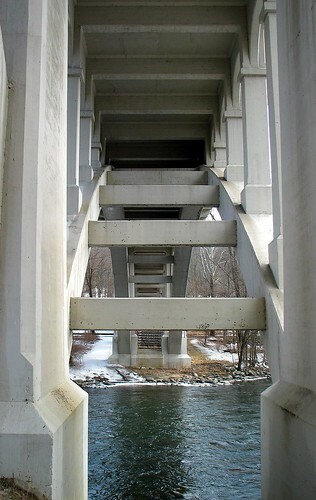 This is the Route 7 Bridge over the Housatonic River. Under the wire and under the bridge! Nice perspective . . . Better late than never, and I dont think anyone posted like this today. Good job. Is it odd that I find the underside of bridges more interesting than the top side of bridges? glad you made it, this is a beaut! great underside shot - it looks pretty darn cold. I'm equally as fascinated by the under-workings of bridges. I think you have one of the best photos. It is really nice. I like to look under bridges, to see if I can spot any trolls. Nope, none there. Bravo for you Jenny! And I think your photo was well worth waiting for. What a neat view. A very different angle that what we see every day. I love the under the bridge view...second one I have seen. I am meandering through the bridges a day late. I'm a week or two late. But I love this view of the bridge. Which I have undoubtedly driven over when I lived down there. Beautiful perspective.